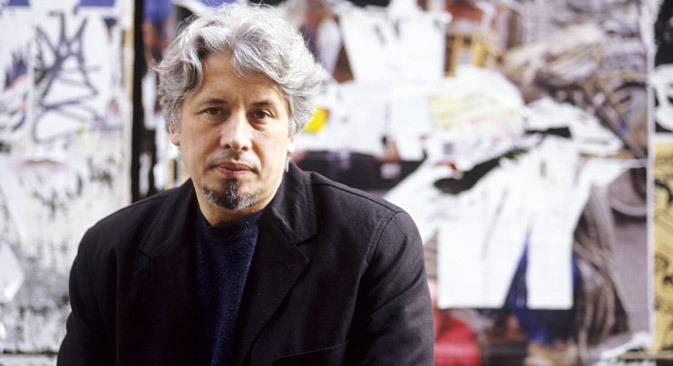 Vladimir Sorokin, who turned 60 on Aug. 7, is a contemporary author who has already achieved classic status. Indeed, he is the only Russian writer to be nominated for the International Man Booker Prize. Sorokin, whose novels include The Norm, The Queue, Day of the Oprichnik and Telluria, has turned his recent creative energies to art, and at this year's Venice Biennale he partnered with the artist Evgeny Sheff to set up an exhibition dubbed Telluria – a kind of “national pavilion” representing a fictional state. N.K. : How comfortable are you in the modern world? The present day is distinguished by features such as TV shows and social networks. Do they hold any interest for you? Vladimir Sorokin: I don’t particularly engage with either. I do sometimes log in to Facebook using my wife's account, but that’s a rare occurrence – I just don't feel the need. As for the TV shows ... I've watched Rome, Game of Thrones and some other things I don't even remember now. But at a certain point, you notice that the show degenerates into monotony. I can empathize with both directors and screenwriters – they need to generate profits. But, still, I prefer classic cinema. N.K. : Something else that defines our era is writers getting involved in social activism. Can this be useful for an author? V.S. : Using literature as a battering ram has always been harmful for it. Think about people from the 60’s – what’s left of them now? I am a civic-minded person, but I don’t like crowds, so I stay away from public rallies. No crowd can make me want to join in. And I think that writers who are so eager to get on their soapbox haven’t written enough. Either that, or they just can't write anymore. Nabokov, Joyce, Kafka – none of them would go to a protest rally. N.K. : When Day of the Oprichnik came out, you said that a civic awareness had awakened inside you. How is this fairing now? V.S. : It’s kind of gone back to sleep. But, jokes aside, I was staunchly anti-Soviet after turning 20 – I hated the Soviet regime. Even then, I knew that the European-style democracy was the normal human way of living. I still hold this point of view. Everything was more accentuated in Day of the Oprichnik, which was what the genre itself dictated. I guess that when the country is going down the drain, it gets hard to keep your civic awareness confined inside you. Your inner civic-minded citizen pours out of you! Sounds dubious, right? Well, this could be a manifestation of cowardice ... Navalny, for one, would criticize me for that. Nevertheless, I learned a long time ago that you can't change the mentality of a people quickly. It is not about changing the regime. Europeans have long lived in a world where the state serves them. Here in Russia, we've been in the service of the state for hundreds of years. This is the main ontological difference between us. N.K. : Who else are you? Are you a Muscovite? V. S.: I was born in Moscow region, and I live here. I try to spend as little time as possible in Moscow itself. The city lost its identity in the last 20 years and I don't really feel at home there. Berlin is another matter altogether, though. It’s a very spacious city with a pleasant atmosphere. It’s like New York in that it accepts everyone – it doesn’t make distinctions between people. N.K. : You once said you are a good cook as well as a part-time painter and decorator. So you are going to be just fine. V.S. : (laughing) Sure, at least I won't go hungry – as long as I’ve got ingredients, of course. But I am becoming increasingly convinced that being a writer isn’t a trade. It is an activity of sorts – one that is largely forced on you, that is connected with the specificities of your body and mind. Someone – I think it was T.S. Eliot – said that literary works are written not to create emotional feelings, but to get rid of them as quickly as possible. And, hell, what kind of a trade is getting rid of emotional feelings? N.K. : You have mentioned several times that you find literature more interesting than painting. And then, out of the blue, you produce 15 oil paintings. What happened? V.S. : It’s hard to say, really. The original idea was quite simple: my new Berlin apartment had blank white walls and I wanted to decorate them with something. Eventually, I decided to paint an oil painting. I went to the giant Boesner store, which a real paradise for painters – it has everything you might need. I remembered how, back in 1970's, I had to procure Kolinsky sable-hair brushes and Dutch gouache paints from illicit dealers, how I couldn’t find a decent canvas ... I have to say, this store almost reduced me to tears (laughing). So, I bought paints, a canvas on a stretcher frame and everything else I needed, and I went for it. The idea to go back and try painting again had been popping back up in my mind for a long time. I tried to understand why this happened. I guess I didn’t achieve something I really wanted when I was young. I didn’t manage to show what I can do as an artist, since my literary career swept everything away. N.K. : So, at some point, you realized that it was something more than decorating your apartment? V.S. : Yes, when I was on my second or third picture. The project appeared some time later. The artist Evgeny Sheff and I created the Telluria pavilion. My novel helped a lot, of course. N.K. : When Telluria was published, you said that describing the modern world within a linear novel is impossible now. But what if we go even further? Is a uniform artistic language unachievable? Has the era of the new syncretism dawned? V.S. : You mean “Gesamtkunstwerk”? But this has already happened. If you examine contemporary art, you can see that it is syncretic. But I actually wanted to challenge that – I was trying to archaically defend the painting as an art form, since it had already been consumed by the sum-total of artistic technologies. I believe it is the time for us to go back to genre purity.